Here are some of the big events in Kerry in 2017. Visitors to these events should ensure that they book their accommodation on time as there are often very big crowds attending and accommodation is scarce if you leave it to the last minute. Traditional music & dance including live concerts, dance classes, music workshops and talks. Young musicians and a young singers concert, a school’s programme and much more. This event is growing by the year, now attracting thousands of participants including prominent international athletes as well as fun runners. There is a Marathon, Half Marathon, 5k and 10 k races. Festival with a big reputation featuring films range old and new, documentaries, feature films and more. Also workshops, masterclasses and children’s programmes. See http://www.dinglefilmfestival.com/ for full details. Traditional music all weekend in bars and restaurants and on the streets with concerts, sessions, workshops and much more form local and national musicians. One of the biggest car rallies in the country, this annual event attrats a large number of entries in various classes and a large following which makes for a very lively and busy weekend in Killarney. This is a very successful event but some of the celebration can be quite boisterous, so if you are lookingg for a quiet weekend it might be advisable to pick another time. Enjoy some great horse racing at Ireland’s most scenic course. Also fashion, fun and food. This is one of Ireland’s foremost literary festivals. It has grown over 30 years and celebrates the writings of Listowel’s famous writers as well a putting on competitions for new writers, a weel of plays, readingd, workshops, music and much more. This fascinating event attracts bike enthusiasts in their thousands from all over the world every year. There is a great variety motorcycle events, activities and attractions with three stages on site with live entertainment throughout the day and night. Witness bike outings with hundreds of bikers on tour and see some fantastic bikes including numerous Harley Davidsons. See full details at http://www.irelandbikefest.com/. The festival for passionate gamers returns to Killarney. Zones and games for all ages, including a Minecraft Zone, Over 18s area and more. The Virtual Reality and Tech Zone, showcases the latest headsets and cutting-edge technology. Thousands of cyclists, many fundraising for charities, attempt to complete the beautiful but gruelling 112 miles of the Ring of Kerry. This is the 33rd year of this event which attracts participants from all over the world. A festival which is thought to originate in Pagan times, where a male (puck) goat is captured and crowned king and raised aloft on a platform in the town centre. There is also a beauty contest, a horse fair, street stalls, music and entertainment and general ‘craic’. Coverage of this event is one of the most watched programmes on RTE television. What started as a beauty pageant is now a week long festival of music, fun, street entertainment, theatre, street stalls, partying and more. This is for astronomy enthusiasts and the growing number of people interested in the International Dark-Sky Reserve. This area of Kerry is one of the few places designated as Dark-Sky Reserve because the skies can be seen much more clearly because of the absence of light and other pollution. This is the most scenic Marathon in Ireland. Starting at The Marina in Dingle and taking in Ventry and Slea head, runners will experience spectacular views of West Kerry and The Blasket Islands. There is both a full marathon and half marathon with serios athletes, fun runners and walkers taking part. The Harvest festival in Listowel is the last racing festival of 2017. Some great racing including The Kerry National which is one of Ireland’s top handicap steeplechases. Great National Hunt and Flat racing throughout the week. Food, drink, music and general merrymaking for the whole week in the town of Listowel. 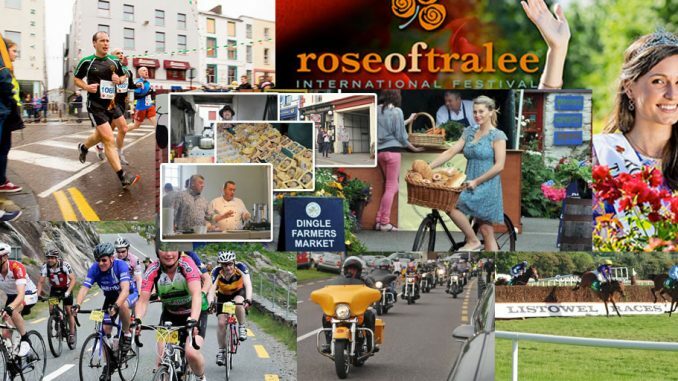 This has grown to be one of Ireland’s foremost food festivals. Most of the local restaurants participate in the food trail and tastings. Daily cookery demonstrations and master classes given by well known chefs are just a few of the events and there are numerous food stalls, street entertainment, music,kids entertainment and more.